Labour's Stephen Kinnock said he and other MPs were having discussions with the DUP to try and win their support for this option. 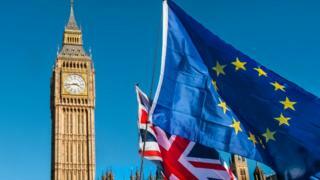 MPs will vote for a second time on a series of options later on Monday, amid deadlock over the government's withdrawal deal. Mr Kinnock is backing Common Market 2.0 - a proposal that would keep the UK closely tied to the EU. Mr Wilson, the DUP's Brexit spokesman, said the party had abstained on voting for the Common Market 2.0 model last week and would probably do the same again. He added that he did not think a softer Brexit option was "inevitable" and Prime Minister Theresa May still had the "opportunity to negotiate hard with EU". "They need agreement just as much as we do," he said. The so-called backstop is an insurance policy designed to avoid a hard border "under all circumstances" between NI and the Irish Republic. Mr Kinnock told BBC News NI that MPs supporting Common Market 2.0 were involved in "intense discussions" with the DUP. 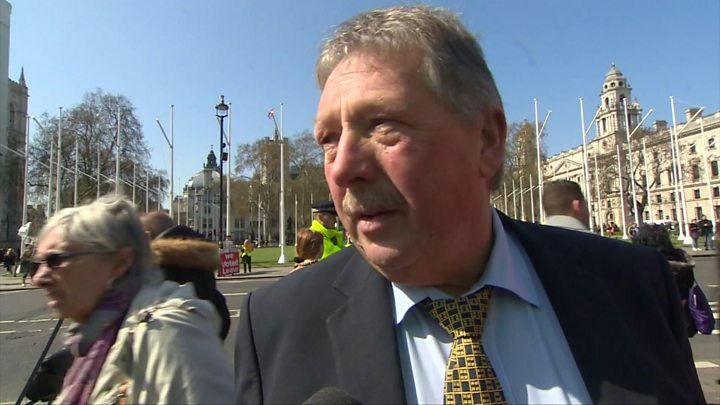 "They understand that frictionless trade is what deals with the backstop and means it would never have to be used and that's why they abstained from Common Market 2.0 on Wednesday," he said. "I think that was a very interesting signal that the DUP can see that Common Market 2.0 is a way of leaving the European Union, but doing so in a way that means the backstop never needs to be activated." However, DUP leader Arlene Foster said the party was "not in any discussions with the Labour party". "It is quite funny actually, if we talk to other MPs now we're in intensive negotiations with these people," she said. The DUP leader also said reports that seven of her 10 MPs backed Mrs May's withdrawal agreement were not true. The UK is now scheduled to leave the EU on 12 April, after MPs again rejected the withdrawal agreement. Monday's votes at Westminster are non-binding, but the intention is to see what outcome, if any, commands a majority. Meanwhile, Conservative MP Richard Drax has apologised to the DUP for voting in favour of the government's withdrawal agreement last Friday, having previously opposed the deal twice when it was voted on in Parliament. Mr Drax said he had "let down my colleagues in the DUP". On Sunday evening, Mr Wilson said that his party would not vote for the prime minister's Brexit deal even if she presented it to the House of Commons "a thousand times". Speaking to BBC News NI, he said the party's position was fixed. On Friday, the DUP's deputy leader Nigel Dodds said he would prefer to "remain in the EU rather than risk Northern Ireland's position" in the union. The party has stressed that the Irish border backstop, contained in the government's deal, breaches the party's one red line when it comes to Northern Ireland being treated differently from Great Britain. Away from Westminster, Sinn Féin leaders, Mary Lou McDonald and Michelle O'Neill, are in Brussels to meet the EU's chief Brexit negotiator Michel Barnier. After the meeting, Ms McDonald said the backstop would have to come back in a "new iteration, another form" if the UK left without a deal because the UK had commitments to Ireland enshrined in international law. The "chaos" at Westminster had left Irish people feeling "concern, frustration, worry and dismay," she added. Meanwhile, UK agriculture ministers have warned that some sectors will suffer "significant stress and disruption" in the event of a no-deal Brexit. In some of the strongest language to date, ministers also said that devolved administrations would not have the cash to cope unless Treasury made extra money available. Last week, a group of Environment, Food and Rural Affairs ministers from around the UK attended a meeting in Whitehall and a statement was released later. Northern Ireland was represented by Lord Duncan.